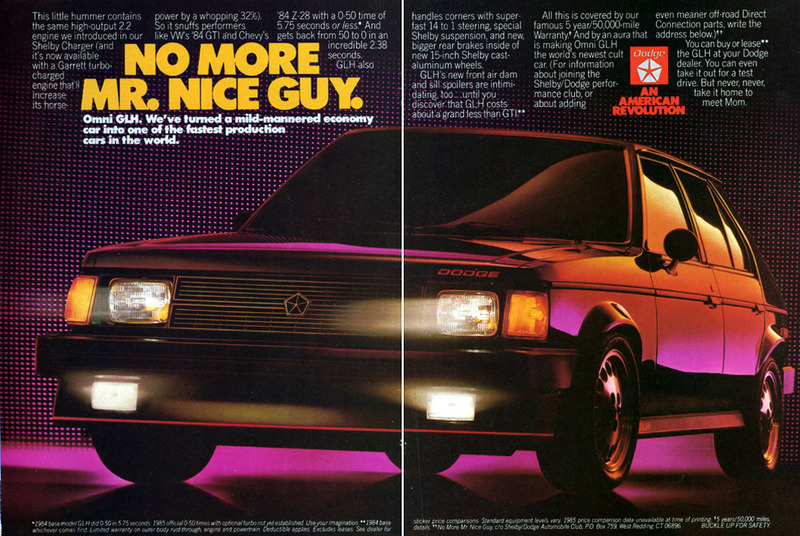 Though 1984 was the debut year for the Dodge Omni GLH, 1985 was the first year that Chrysler’s 2.2 liter Turbo I turbocharged inline 4 was available with it (for an additional $872). Packing 146 bhp and 170 lb-ft of torque, the turbo delivered 0-60 times in about 7.5 seconds. Standard power on the GLH was the 2.2 liter High Output 110 bhp inline 4 and both engines came with a five speed manual transmission. 1985 Dodge Omni GLH pages from the 1985 Dodge Performance brochure, linked from the Old Car Manual Project’s amazing brochures section. Mileage for the turbo was from 21 city/30 highway (18/27 by today’s standards) on premium gasoline. Giving up the turbo took you to 25/34 and let you run on regular fuel. Range with the 13 gallon gas tank was almost 300 miles with a 10% reserve. The base price for an Omni GLH was $7,620 (about $16,600 in 2015 dollars). For that money, purchasers got a front air dam and side skirts, both finished in black, as was the grille. Distinctive aluminum 16-hole “pizza” wheels rolled on low-profile 195/50R15 tires—now considered a tiny size. Power steering, power brakes, and a sport suspension were standard and fog lamps completed the “sporty for a 4-door compact” look. Inside, a GLH was pretty basic. You did get cloth high-backed bucket seats, rallye instrument cluster, dual remote mirrors, intermittent windshield wipers, and an AM/FM stereo radio. The GLH had few exterior add-ons available. Inside, buyers could add options such as air conditioning ($643), automatic speed control ($179), and an AM/FM stereo radio with cassette. Dodge sold 6,513 Omni GLH models in 1985, including 3,004 normally-aspirated models and 3,509 with the turbo, making the GLH about 9% of total Omni/Horizon production for that model year. GLH’s rarely show up in either the Hemming’s Motor News classifieds or on eBay Motors; I don’t think many of these cars lasted even a decade. Make mine black, please—so the ground effects match.